Every Catholic of a certain age remembers the week in January when the Church Unity Octave or the Chair of Unity Octave was celebrated liturgically. The Octave began on January 18, Feast of St. Peter’s Chair in Rome, and ended on January 25, Feast of the Conversion of St. Paul. But, do we know how this important celebration came about? Most, even old timers, would have to say “No!” The story of the holy man who began this octave — as an Anglican, no less — and single handedly encouraged priests, bishops, and finally, the reigning pope to approve, adopt, and spread it throughout the universal church is a fascinating one. That man was Lewis Thomas Wattson, born the third son to an impoverished Episcopalian minister named Rev. Joseph Newton Wattson and his wife, Mary Electa. The elder Wattson, a convert from Presbyterianism to the American branch of the Anglican Church, was forever branded by his expulsion years earlier from the General Theological Seminary in New York City for an imprudent remark he made in jest at the seminary to a group of other seminarians. It was the time of the Oxford Movement in England and the brilliant tracts of John Henry Newman and other great luminaries of that country’s Anglican Church were in heavy circulation. These tracts were written in the hope of bringing the Anglican Church of the nineteenth century back to the more liturgical and sacramental practice of its past. The authors’ intention was definitely not to bring the Anglicans into the fold of Rome, as many erroneously believe. However, as we all know, Newman and several of his companions in the Oxford Movement, eventually did wind up in the “Romish” Church. The “General” — as the seminary was known — was far too Protestant to welcome the Catholic nature of the tracts; they were forbidden literature to the students. Of course, they were smuggled into the place and eagerly read and discussed. Rumor had it that there were a number of “Jesuits in disguise” who had infiltrated the school and were subverting the students with the Popish literature. Young Joseph Wattson, who was a bit of a practical joker, led one of the more rabidly anti-Catholic seminarians to believe that he (Wattson) just might be one of those infiltrators. The matter was reported to the Dean and poor Wattson and another student were expelled, even though they were exonerated of being “secret Jesuits.” The Oxford tracts were causing such a stir in Anglican circles, that any hint of “Romish tendencies” put the seminarian on the suspect list. Not surprisingly, this incident haunted Joseph Wattson for the greater part of his ministerial career with the Anglicans, and the only pastoral positions he was able to find were in poverty-stricken areas. On the other hand, the fate of some of his colleagues at the “General” who did “go to Rome” was anything but prejudicial. Edgar P. Wadhams, for example, sometime after his ordination and priestly ministry, became the founding bishop of Ogdensburg, New York, and Clarence E. Walworth befriended Father Isaac Hecker and became one of the original fathers of the Paulists, an order founded by Father Hecker after he was expelled from the Redemptorists. James A. McMaster, another Oxford convert, entered the Redemptorists, but concluded that he did not have a vocation to the religious life. Instead he became an outstanding figure in Catholic journalism, founding the New York Freeman’s Journal, one of the important Catholic American newspapers of the time. One cannot help but wonder what would have happened had the elder Wattson “poped” at the time of his expulsion from the seminary. Instead, he had to settle for life as a poor rural preacher. When Lewis was born in January of 1863, the Rev. Wattson and his wife, and their two older sons, served an impoverished congregation on Maryland’s eastern shore. Lewis, or “Tommy,” as he was known to his family, was a quiet, pensive boy. Times were tough in this wartime era, but the Wattsons were happy. Tommy loved to fish the many streams of the tidewater area with his father and they grew very close. The elder Wattson was a great storyteller, and one of his favorites was the tale of “Jesuits in disguise.” On one occasion, the son asked the father had he ever been to a Catholic Mass. His answer was, “Yes, once, when my former colleague (Walworth) from the ‘General’ was preaching as a Paulist priest at a great church in Baltimore.” Then the older man remarked, “What we need in the Episcopal Church is a preaching order like the Paulists!” It was to this remark of his father’s that Tommy attributed his calling: he always felt that the Holy Spirit was calling him to establish a preaching order like the Paulists in the Episcopal Church. Because of the need for ministers, Lewis was given a parish immediately. However, because he was still only a deacon, he could not perform the communion service. An arrangement was made with the bishop that his father would perform this duty while the son assumed all other duties. Until his death, the father served his son, and the son cared for his mother until her death. The Rev. Wattson became a powerful and spiritual preacher; his reputation began to spread far and wide in the New York and New Jersey area. He was made presbyter by special dispensation at the young age of twenty-three because his superiors knew that here was a special young man, distinguished by his devotion and extraordinary sermons. His fame spread so rapidly and widely, that he was in demand whenever the occasion called for a notable speaker. By this time, Father Wattson was comfortably settled in at the parish of St. John’s in Kingston, New York. He was beloved by his parishioners for his obvious holiness, speaking ability, leadership and for his personal refinement, charm and kindness. He was a natural sermonizer, rarely preparing his talks ahead of time; he spoke from the abundance of his heart and with trust in the Holy Spirit to inspire him. At first, as a good Anglican, he did not accept papal supremacy or infallibility as the Roman Catholic Church taught it. He believed it to be the only major error of the Roman Church. In retrospect, we can see that Father Wattson was following the pattern of John Henry Newman fifty years earlier, for three years after the above statement, he did what appeared to be an about-face, and, through divine grace, realized the truth of the pope’s full authority and unique charisms to teach, govern, and sanctify the Church. Now, as long as he served St. John’s in Kingston, he was a beloved pastor. Something kept gnawing at him, however. He had not yet founded “a preaching order like the Paulists” for his church. It was at some point during his tenure at St. John’s that Father Wattson, after reading a book about the life of “Il Poverello,” fell under the influence of St. Francis of Assisi, his dedication to total poverty, and his complete resignation to the Will of God. As we can see, he was moving closer and closer to a Catholic spirituality. Here at last was the moment he was waiting for — he would found an order patterned after the Franciscans, dedicated to total poverty, chastity and obedience to the superior. He dreamed of beginning his little group at a small mission church on the outskirts of Kingston that he had built to accommodate the growth in numbers of his parishioners. Now he was faced with giving his order a name. After much prayer before the altar of his church, he determined, like St. Francis, to base the name and rule on how Providence would direct him by opening the Bible randomly three times and choosing the verses from those pages. The randomly chosen verses were St. John 7: 37-39 (receive the Holy Ghost), Romans 5: 11 (Atonement through Jesus Christ), and Corinthians I, 11 (the institution of the Holy Sacrifice of the Mass). (All references are to the King James Version of the Bible.) His eyes zeroed in on the word “Atonement” — the name he gave his order. It would be accomplished through the promise of the Holy Spirit and perpetuated through the Holy Sacrifice of the Mass. He then read the word “atonement” in another way — “at-one-ment.” He would hereafter work for the union of all Christians in one body, as Our Lord intended when he founded His Church. Then he heard a voice tell him, “You will have to wait seven years for this to be realized.” Although surprised and disappointed, he took this as a sign that God wanted him to remain in his pastoral duties at St. John’s for the time being. As believers, we know that all things work in God’s good time. So it was with Father Wattson. He went along with his parish duties as always. Two years later, he returned home from a round of visiting parishioners to find waiting for him a young minister who introduced himself as the Rev. Mr. Johnson, member of a group of unmarried Episcopal clergymen who were living a semi-monastic life in Omaha, Nebraska. Rev. Johnson offered Father Wattson the position of superior of this group of dedicated men who called themselves the Associate Mission. Such a life appealed to him because of his unmarried state and his strong ascetical leanings. He began to believe that the Associate Mission was part of God’s plan for his eventual success as a preaching friar of the Episcopal Church and decided to accept the offer. Needless to say, his congregation at St. John’s was devastated to lose their beloved pastor, although most seemed to understand that he had a special kind of spirituality and was destined for greater things. Father Wattson arrived at his destination in September of 1895 on the Feast of Saint Michael the Archangel. His elderly mother accompanied him and occupied a private apartment at the monastery, passing into eternity two years later. He was a faithful and beloved son, and much admired for his loving treatment of her. Life at the Mission was very much to Father Wattson’s liking. They prayed, worked, studied the Scriptures in their original languages, and attended the spiritual needs of the people of their individual missionary districts. The field of action of the Associate Mission was greatly expanded under Father Wattson, as he added more and more territory to each member. He began to impose a more monastic kind of life, incorporating silence at meals, spiritual readings, and a more rigid schedule. Some of the men were not happy with this new development, and in later years, after he had entered the Catholic Church, Father Wattson — who had become Father Paul — told his friars amusing stories of making monks out of men who did not want to become monks. Knowing the power of the printed word, Father Wattson revived his old parish bulletin The Pulpit of the Cross from his Kingston days. He installed a hand operated printing press and hired a skilled printer to operate it. His object was to spread the word of God far and wide for the salvation of men. Shortly after his arrival in Omaha, Father Wattson began a serious study of the Roman Catholic Church, her teachings and claims. This was something that he could never bring himself to attempt in the past. Over the years, many had speculated in print and in the spoken word that one day, Father Wattson would indeed “go to Rome,” as the bishop had in anger told his father so long ago. A seemingly innocent occurrence — missing his regular train back home after a long day’s missionary work — brought him to visit a Catholic Church near the train station to “pass some time.” As he entered the dimly lit church, the sanctuary light drew him to the altar and the Real Presence of Our Lord and Savior. There he knelt for a long time and poured out his soul to Jesus in the tabernacle, asking for guidance to see the truth and the courage to accept it, even if that truth would force him to admit that what he had accepted all his life was not the truth. When he arose from his prayer, he felt refreshed and filled with determination to follow that truth, regardless of consequences. Returning home, he began a serious inquiry into the Catholic Church, reading everything he could get his hands on, both pro and con. He came to the educated conclusion that the claims of Rome were, after all, true, and communion with the See of Peter was the only way by which men could share in Christian Unity. Peace and joy engulfed him and spontaneously he began to recite the Te Deum. Perhaps he would not have been so joyful had he realized then that for the next twelve years he would be the most controversial figure in the Episcopal Church. It was this conclusion that told him that his work in Omaha was finished. He would return to the East, adopt Franciscan spirituality seriously, and with his newfound companion in the love of Lady Poverty, Sister Lurana White, begin the true work of the Atonement. Accordingly, he resigned his position with the Associate Mission and set out for New York three years to the day after he had arrived in Nebraska. Now we meet a young woman whose dedication to the ideal of holy poverty matched Father Watttson’s. Lurana Mary White was so moved by a sermon that she heard as a young lady, that she determined to dedicate her life to God and to serve Him always. To that end, she entered the Sisterhood of the Holy Child, an Episcopalian order of nuns from whom she had received her education. Although the sisters did not take vows of poverty, chastity and obedience, the bishop allowed Sister Lurana to take these vows privately. Even this did not satisfy her inner longing, for she wanted to be a part of a religious community that took those vows corporately. She had heard of Father Wattson’s work in Kingston and Omaha, and with her superior’s permission, she wrote to him inquiring if he knew of a group of sisters in the Episcopal church which took those vows corporately. While Father Wattson had to answer her in the negative, he nevertheless encouraged her in her quest. Thus began a correspondence and a holy friendship that lasted until Sister Lurana’s death many years later. They corresponded over a period of two years and finally met in person in 1898. They found that they were of the same mind in their determination to serve God in true poverty. Father Wattson proposed to Sister Lurana that perhaps she could head a women’s branch of the Society of the Atonement. To accomplish this, Sister Lurana left the Sisterhood of the Holy Child to study and prepare for a life of poverty with the Sisters of Bethany in London for a year. At the end of her studies there, she was clothed in the brown habit of St. Francis. Before returning to America, she and her sister traveled to Rome and Assisi. Sister Lurana loved Rome for its thoroughly Catholic atmosphere, but it was at Assisi that she truly felt the spirit of the great St. Francis. She knew then that she had chosen what God willed for her. Even at this stage of her life, she was convinced that the Pope of Rome was the true Vicar of Christ upon earth. In her Memoirs, Sister relates an amusing story of her visit to St. Peter’s Basilica in Rome. Upon entering the great church, she and her sister bumped into two old “very Protestant” friends from America. Having already found the bronze statue of St. Peter on his papal throne, she tried to figure out a way that she could venerate the statue without scandalizing her friends by so Catholic an act. Very coyly she directed them to “a most interesting statue” around the bend and many feet away while she rushed back to kneel and kiss the Apostle’s feet. At that moment, she made a private act of allegiance and loyalty to the reigning Holy Father, Leo XIII. Upon her return from Rome, Sister Lurana wrote to Father Wattson to let him know that she was back and ready for further advice from him. He could see by her letter that she was now a mature woman who knew what God wanted of her. It was about this time that Father Wattson was immersed in his intensive study of the Roman Catholic Church and beginning to have a change of heart, leaning more and more toward Rome. In the meantime, he had returned to the Kingston area with no parish, no income, and no specific plans, except his dream of beginning his society. Meeting at the home of Sister Lurana’s sister, The Terrace, the two religious spent a weekend of prayer and retreat praying and planning the future of the Society of the Atonement. At the end of the three-day retreat, they made a covenant to begin their new religious order in the Episcopal Church. From that day forward, Father Wattson never had the slightest doubt that they had made the right decision. They had neither money nor lodging, but they knew that Providence would provide in their new-found resolution to proceed with their mission. Sister Lurana had learned from a Sister Angela, a religious-friend whom she had met in London, about an abandoned church in the area of Garrison, New York, across the Hudson from West Point. It seems that three pious Anglican ladies discovered this derelict country church in their drives from their home in New York City to the countryside around Garrison. They were properly appalled at the run down condition of the building and took it upon themselves to clean it out and spruce it up. Apparently, they were quite persuasive, for they convinced an Episcopal clergyman from the City to re-dedicate the building to St. John the Baptist, and hold an occasional service there. It became know as “St. John’s in the Wilderness.” The small piece of property on which the church stood they named “Graymoor” after two men who were closely associated with the tiny chapel in its early incarnation, Dr. Gray, the preacher who had built the chapel, and Mr. Moore, a professor at Columbia University who had been its biggest benefactor. Amazingly, these three Anglican ladies were lovers of St. Francis. They expressed their wish to Sister Angela, now living in nearby Peekskill, that some religious order of sisters would occupy the property. She, in turn, conveyed that information to Sister Lurana, and the deed was done. The ladies asked Sister Lurana and her one Sister to take over care of the chapel and surrounding property. Thus, the Society of the Atonement came to Graymoor. Father Wattson knew that he would need some type of preparation to be the leader of a monastic-type order. To that end, he spent two years living the life of a religious novice at the Episcopalian Order of the Holy Cross in Maryland under his old classmate from the “General,” Father Sargent. Here was a thirty-four year man, who had been a successful pastor since his early twenties, subjecting himself to the humiliation of “starting over” as a mere novice under a man his own age. Fortunately, Father Huntington, the rector of the place, was compassionate and understanding of his reasons for being there. Unfortunately, Father Sargent was an unfair and cruel taskmaster, bent on humiliating his novice and demeaning his intentions of forming a new monastic order. Father Wattson spent two years at Holy Cross, knowing that, in the long run, it would prepare him well for his duties at Graymoor. When the local clergyman who acted as the sisters’ chaplain moved out of the area, Father Wattson left the Holy Cross novitiate and went to Graymoor to take the position. He never left. As one can imagine, when two professed religious who have made vows of poverty begin a new order in buildings that could charitably be called shanties, the first few years were going to be particularly hard. And they were. Mother Lurana (as she was now called) and Father Paul (as he was now called) had no possessions and had vowed never to handle money, but they had great faith, and great hope that the Good God who had led them there would allow them to succeed. Father Paul fell in love with the area. When he found out that the whole mountain above the sisters’ chapel and convent could be purchased for the sum of three hundred dollars, he knew that the price was more than fair. If the price had been ten cents, Father Paul could not have had it, for he had nothing, but Providence intervenes where humans cannot. It seems that on Mother Lurana’s transatlantic return to the United States, she had met one Miss Buxton, an English lady who had lost her Christian Faith. Mother gave her a book on the life of St. Francis, and her conversion was almost instantaneous. Upon her return home to England, she related her conversion story to her sister and her brother-in-law, Doctor John Taylor. The Taylors were so grateful to the good sister for their relative’s return to Christianity that they sent the money to Graymoor for the purchase of the twenty-four acres of mountain property. To make the story even more edifying, some years later, the same Miss Buxton entered the convent of the Sisters of the Atonement after it had become Catholic, and today she lies in the cemetery at Graymoor. On June 14, 1900, Father Paul planted a heavy, rough wooden cross, made by his own hands from a tall cedar tree upon the summit of the mountain. It was the feast of Corpus Christi. He wrote on the back of the deed to the property that he would hold it in trust “until that day as the Anglican Communion shall have been reconciled to the Vicar of Christ and received back into communion with the Holy Roman Church. . . .” Truly, this was a man who was Catholic through and through. Mother Lurana was the first to move to the property. She and her one companion lived in a ramshackle hut near the little chapel. They had no heat, no electricity, nor any of the ordinary comforts that even the poorest would have. Still, they were content, knowing that they were serving Lady Poverty in the spirit of St. Francis. The first winter, with deep snows and extreme cold, was exceedingly difficult, but they persevered. Father Paul joined them after leaving Holy Cross. He hoped to find a cave in the area to spend the winter, but there were none. A workman showed him an old paint shack nearby with big gaps in the outside walls; here he could winter over. Father Paul called it the Palace of Lady Poverty, and, for a time, he happily made it his home. One of the first orders of business was to decide on a habit for the Society of the Atonement friars and sisters. He and Mother Lurana put their heads together and decided upon a coarse grayish tan cloth, much like that worn by Il Poverello himself. It was caught at the waist with a white cincture and had a shield-shaped scapular with the emblem of the Society on the breast. The emblem consisted of a Star of David, symbolizing Hope, a heart within the center of the Star of David, symbolizing Charity, and a five-pointed star within the heart, symbolizing Faith. Mother Lurana made Father Paul’s first habit, and her sisters sewed every subsequent one that he wore, even the one he was buried in. Finally, convinced that the only way to repair the breach that had occurred in the sixteenth century was for the Anglican Communion to recognize the reigning pope as head of the Christian Church and for all Anglicans to return to Rome corporately (that is, as a body), Father Paul began to preach his message in his own chapel and in every Episcopalian pulpit to which he was invited. He preached it on the streets of New York City and environs, causing such a stir that even the secular press took note. Needless to say, he made many enemies in the Episcopal Church. Friends whom he had known for years began to shun him openly; his followers began to dwindle; and contributions to the great preacher and his mission dropped precipitously. Father Paul did not back down to pressure, and, in fact, preached his crusade all the louder. Finally, on September 10, 1901, the situation exploded when he was invited by his good friend, Reverend Charles Jessup, to preach at the evening service held in his church during the meetings of the Episcopalian Archdeaconry of Long Island. He had been requested to preach on “The Spirit of the Missions.” Basing his talk on the success of English missionaries before Henry VIII broke from Rome, and the abysmal failure of them after the revolt, he begged his audience (all Episcopalian clergymen!) to work towards his beloved “corporate reunion” with Rome under the Holy Father as Vicar of Christ. As the congregation grew more and more tense, a presbyter from the North of Ireland approached the Archdeacon and demanded that he “stop that man from preaching such popery!” The talk was ended, and so was Father Paul’s future in the Episcopal Church. In later years, after he entered the Catholic Church, Father Paul amused many a Catholic audience with that story, but at the time, it certainly was not funny. Father Paul never lost his love for the Anglicans, and constantly prayed that they would follow him into Christ’s One, True Church. In 1896, Pope Leo XIII declared finally and firmly the invalidity of Anglican Orders. This was a serious blow to Father Paul, who had never doubted the validity of his own orders, or that he celebrated the true Holy Sacrifice of the Mass, or that Our Lord was truly present in his tabernacle. For a while, he could not accept the pope’s judgment. He “sat on the fence” for quite a time, and was later criticized for doing so. Apparently, Father Paul did not quite understand the meaning of the doctrine of papal infallibility. When he finally did understand, he humbly accepted the declaration of the Holy Father. At last, because of its strong pro-Roman stance, Graymoor stood in big trouble with the Episcopal authorities. Proceedings were instituted against Father Paul for heresy by the local diocese, and the Bishop Visitor resigned his position as the official bishop over Graymoor. Although the heresy trial never happened, Father Paul was just about done in the Anglican Communion. The death blow to corporate reunion came in 1907 when the General Convention of the Episcopal Church passed an amendment to allow the “open pulpit” — that is, to allow any “ordained” minister from any Christian congregation to preach in any Episcopal Church. Now, any Protestant preacher could come into an Episcopal Church and address the congregation. This opened the formerly conservative Episcopal Church to modernist preachers. Men who rejected whole sections of the Bible, and others who even denied the Divinity of Christ, now had access to the pulpits of the Episcopal Church. Havoc and confusion reigned among the ranks of Episcopalian clergymen and laity. High Church Episcopalians deplored the development. The scandal helped many to see the truth and come into the Catholic Church. By the end of 1908, twenty ministers and hundreds of lay folk had “poped.” The American Episcopal Church lost some of her best minds to Catholicism because of the open pulpit movement. Amazingly, before he entered the Catholic Church, Father Paul of Graymoor promoted a worldwide devotion through The Lamp to the unity of all Christian Churches under the See of Rome. This he named “The Church Unity Octave.” Spreading the ideas written in the book England and the Holy See by Reverend Spencer Jones, he stated that the Catholic Church alone was the living expression of the full Christian tradition. Unfortunately, individual conversions were discouraged in favor of Corporate Reunion. Reverend Jones suggested to Father Paul that one day a year be set aside for special prayer for Christian Unity and public sermons on the Pope. To Father Paul, one day did not seem enough; so he proposed a full octave — from the Feast of St. Peter’s Chair at Rome, January 18, to the Feast of the Conversion of St. Paul, January 25. He drew up official prayers for the Octave and promoted it in the pages of The Lamp. The first observance of the Octave would be January, 1908. It is to his credit that Father Paul, while still an Anglican, garnered the support of both Anglican clergymen and Catholic priests and prelates. Even the Archbishop of Boston, William Cardinal O’Connell gave it his whole-hearted approval. Not surprisingly, shortly after the celebration of the first Church Unity Octave, Father Paul began negotiations with Catholic authorities, which led to the full submission of the Society of the Atonement to the Catholic Church in October, 1909. What difficulties lay ahead for Father Paul and Mother Lurana! The happiness they enjoyed now that they were finally at home with Rome was tempered by legal problems with the Episcopal Church, which tried to take away the property of Graymoor, and by the fact that Father Paul was not really “Father” at all. Legally, of course, the Graymoor property belonged to Father Paul and Sister Lurana according the original deed. After some time, that problem being settled, the sisters were faced with a similar legal battle on their convent property. The fact that Mother Lurana refused personally to own property complicated the situation. After more than seven years of negotiations, and the assistance of some heavyweight state politicos, including the Honorable Hamilton Fish, a state assemblyman and prominent Episcopalian, the sisters were finally granted title to their small property. Later they were able to acquire more property due to the generosity of the local citizenry, Catholic and Protestant alike, who resented the attempt to evict them from their convent. “Father” Paul was not a priest, but merely a Catholic layman. His friend, Father Paschal Robinson, OFM, acted as unofficial chaplain at Graymoor, saying Mass everyday for the community and attending to their spiritual needs. But, it was difficult convincing priests to live in the freezing wilderness; many came and went, giving varying excuses why they could not live at Graymoor. Fortunately, Archbishop Farley of New York was caring and compassionate. He guided them along step by step, knowing that they needed lots of paternal care as newcomers to the Church. Father Paul was permitted to attend the archdiocesan seminary in Yonkers, New York, where he would make his priestly studies. He entered in November, 1909. The seminarians there were overjoyed, for they had been following with interest the path of Graymoor to Rome and had assumed that Father Paul would eventually be ordained a priest of the Church. He was allowed to attend the seminary from Sunday evening through Wednesday and spend Thursdays through Sunday afternoon managing things at Graymoor. His workload was exhausting, but he persevered, knowing the importance of the outcome. The intention was to expedite his priestly training and ordain him as soon as possible. He was forty-six years old when he entered St. Joseph’s Seminary as “Brother” Paul. He was again “Father” Paul with his ordination on June 16, 1910. The archbishop had actually wanted him to complete another year of theology before receiving holy orders, but the Sisters of the Atonement had made a Novena to Our Lady of Perpetual Help that he might receive a dispensation. Sure enough, the archbishop changed his mind and set the date for Brother Paul’s ordination for June 16, 1910, a mere seven months after entering the seminary. Only a few friends were invited for the ceremony, among them was Venerable Solanus Casey, the Capuchin mystic, who was stationed in Yonkers at that time. Apparently, that year, the feast of Our Lady of Perpetual Help, fell on June 16; it was a movable feast then, made by Pope Pius IX to fall on the Sunday before the feast of the Nativity of Saint John the Baptist. With the Society of the Atonement now received corporately into the Roman Catholic Church, life did not become easier for the religious there. First of all, Father Paul suffered much criticism from his former co-religionists, both for his move to Rome and for his retention of the property, which many were under the mistaken notion belonged to the American Episcopal Church. He had to make clear time and time again the situation regarding the property. He also had to reveal that the real method by which the Society was supported was not from contributions from his Episcopal congregation, but through the sisters’ begging on the streets of the large cities of the area. Indeed, most of the funds that the sisters collected by this method came from Roman Catholic pockets on the streets of New York City. It is notable that some of his most vocal critics among the Episcopalian clergy eventually converted to the Roman Catholic Faith, including his former classmate from the “General” — the minister who gave him such a hard time in the novitiate at Holy Cross — Reverend Henry Sargent. Some of these men took the next step and were ordained to the Catholic priesthood. Sadly, among his greatest persecutors were some of his new co-religionists. One of these men gave him the greatest heartbreak of his life. Father Francis was ordained to the priesthood in 1913 and became the first priest besides Father Paul himself to serve the Society of the Atonement. Poor Father Paul trusted this man to serve him humbly and well. Unfortunately, Father Francis undermined his authority to the extent that most of the young men who lived at Graymoor with the intention of becoming friars or priests were spirited off one afternoon after Father Francis could not succeed in an attempted ouster of Father Paul. He was a liar and deceiver and broke Father Paul’s heart. For a long while, only Father Paul and Brother Anthony, whom Father Paul, while still an Anglican, had converted from Judaism, remained at Graymoor. This sad incident taught Father Paul that tighter discipline was necessary among the friars and particular friendships in religious life are a danger. He was learning to be a superior in a religious house the hard way! Father’s preaching ability was well known in the Catholic world; he was invited to St. Patrick’s Cathedral in New York City to preach a mission there to hundreds of non-Catholics at the invitation of Archbishop Farley. His fame became so great that he was even invited to preach as far away as Chicago. Unfortunately, it was these absences from Graymoor that had allowed the situation with Father Francis to occur. After that incident, Father Paul’s duties kept him at Graymoor. An absentee superior was not very effective! Shortly after Graymoor became Catholic, the financial situation improved, thanks much to the assistance of Archbishop Farley of New York. The original chapel was completely renovated. A larger chapel was built at the summit of the Mount of the Atonement, designed by one of the most famous architects of the day, and one of Father Paul’s most eminent converts, John Cyril Hawes. After his conversion, Mr. Hawes was ordained and became one of England’s most prominent Catholic churchmen. He later served in Australia and the Bahamas, where he was known as Father Jerome. He honored both St. Francis and Father Paul by wearing the coarse habit of the Atonement. In 1912, ground was broken at Graymoor for a minor seminary, St. John’s. 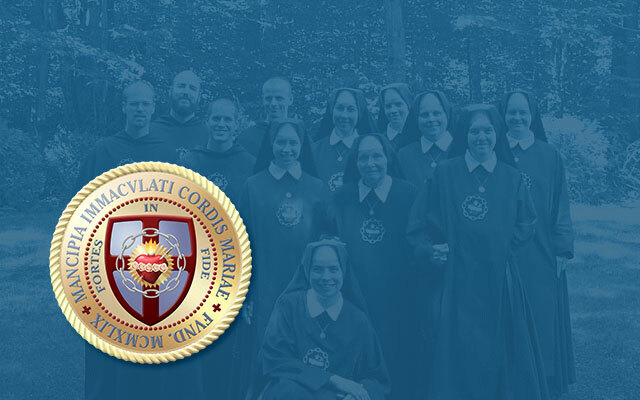 When it opened the following year, there were only four students, but this did not discourage the man of great faith, for he knew that Our Lady smiled now on Graymoor and that she would send many more seminarians. In the ten years between 1915 and 1925, two more of Father Paul’s great dreams were realized — a major seminary adjacent to the Catholic University in Washington, D.C. was opened, and Graymoor Press at Peekskill, New York was established. Father Paul was overwhelmed with gratitude at the graces that flowed from above on his establishment, but he did not rest. He still had much to accomplish. Long before he became Catholic, Father Paul had the inspiration to send the “fragments” to the Christian overseas missions. He heard in his soul a voice repeating the words of Our Lord, “Gather up the fragments that remain, that nothing be lost.” He thought that if the Christians of America could be trained to save for the Foreign Missions, the fragments, which they carelessly throw away, would be enough to supply material assistance to all the missionaries in faraway lands. Although he publicized this intention in The Lamp, it was never very successful until after Graymoor became Catholic. This effort he named The Union-That-Nothing-Be-Lost, after Christ’s words. He prayed one day during the Consecration of the Mass for a sign that this was pleasing to Our Lord. A few days later, a scruffy, emaciated old gentleman came to Graymoor asking to see him. Initially, Father thought that he was just one more of hundreds of men who were down on their luck in these hard times and needed a place to stay and a few meals. The gentleman was John Reid from Connecticut. The purpose of his visit was to ask Father Paul if he, John Reid, could help him educate young poor boys for the priesthood. He considered Father Paul a Christ-like priest, and knew that if anyone would use money wisely, it would be he. John Reid had lived like a pauper all his life, working a small field that his parents had left him and scratching out a living. He was beyond frugal, having no electricity, and even making the candle that he used for light in the evening last many months. Father Paul accepted the offer; John spent some days resting at Graymoor before his journey home. Several days later, Father Paul, to his amazement, opened a letter containing a bank draft for five thousand, two hundred dollars. Father saw this as representing the five barley loaves and the two fishes with which Our Lord fed the multitudes. This was his seed money for his own seminary at Graymoor. It was also the impetus for his missionary union, which he publicized through The Lamp. This time, his efforts at fundraising were successful beyond his wildest expectations. In Father’s mind, the intention was that the offerings be sacrificial in nature, helping the recipients, while gaining merit for those making the sacrifices. It helped to fund Catholic priests and sisters working all over the world in mission lands such as China, India, Africa, and the Pacific Islands. It built churches and medical facilities and sent medical personnel to people who had never seen a doctor. All this was achieved through the good will and effort of this holy priest who wished to save souls for Christ. From the Union-That-Nothing-Be-Lost came the Catholic Medical Mission Board, still functioning under that name, and the Rock of Peter Foundation, a trust used for the construction of Catholic churches, schools, hospitals and other charitable institutions. Again, sadly, criticism came from many quarters. It is possible that some of the Christophers were escapees from nearby Sing-Sing Prison — Father Paul never asked. Some of his contributors disapproved of “lazy bums” taking advantage of his charity. In his heart, though, Father knew that he was doing the Catholic thing. If he could help even one of his beloved Brothers Christopher to become a productive citizen and better Catholic in the process, the entire effort was worth the expense and trouble. Only two of the wayfarers who stopped stayed on. One was “Kelly.” This man made himself useful for twenty-four years tending the gardens on the sisters’ property. The other was the “incinerator man” who, during his several weeks at Graymoor, lived in a shack near the incinerator and tended it carefully. Both were given Catholic funerals and are buried on the property. Without question, the greatest love of Father Paul’s mission was the Church Unity Octave. Observance of the Octave was publicized in The Lamp, and with the corporate union of the Society of the Atonement within the Catholic Church, the celebration really became popular. Three months after the conversion, the first Church Unity Octave was celebrated under Catholic auspices, with the blessing of both the Archbishop of New York and the Apostolic Delegate to the United States. In January, 1910, Father Paul received a letter from the reigning Pontiff, Pope Pius X, sending his “wholehearted blessings to Father Paul, the Society of the Atonement and the spread of the Octave of Prayer for Unity.” This began an intensive letter-writing campaign by Father Paul to Catholic bishops in this country and around the world.The response of the bishops was so positive, that Cardinal Farley petitioned Rome for the decree of official recognition of the Octave as a form of prayer for the Universal Church. Cardinal Merry del Val himself, Secretary of the Congregation of the Holy Office, sponsored the petition in Rome. On February 25, 1916, the new reigning Pontiff, Pope Benedict XV extended its observance to the Universal Church; he also attached indulgences, both plenary and partial, to it. This development filled Father Paul’s heart with joy. The Octave was now an official public devotion of the entire Catholic Church. Later, in 1927, the Octave was renamed the Chair of Unity Octave to avoid confusion with other celebrations for unity. In Father Paul’s mind, the next step should be that the celebration of the Octave be made obligatory worldwide throughout the Church. This would have been a highly unusual step. Although he did make this petition to the highest authority of the Church, it was not wholeheartedly supported and was never made obligatory. Graymoor was not the only non-Catholic group to enter the Church corporately around this time. Several other groups of Anglican communions were reunited with Rome, including The Anglican Benedictine Monks in Caldey, England, the Benedictine nuns of St. Bride’s Abbey in Wales, the Servants of Christ the King in Surrey, England, and the Sisters of the Love of Jesus in Canada. The largest segment to reunite with the Church at that time was not Anglican. It was a group of Syrian Jacobites from India, under the leadership of Archbishop Mar Ivanios, who have been known ever since as the Syro-Malankara Church. Now one of the many sui juris Eastern-Rite churches under the Papacy, the Malankara Catholics initially numbered just over ten thousand and now have more than five hundred thousand members. All these were the fruits of the celebration of the Church Unity Octave and of Father Paul’s prayers, hard work, and good example. There was an attempt to “water down” the intention of the Octave by some Christians, including an influential Catholic priest, Abbe Paul Couturier of France. Their adjusted prayer became “the reunion of Christians in the manner best pleasing to Christ,” rather than “reunion under the authority of the Successor of Saint Peter.” Many non-Catholic Christians, especially the Orthodox, jumped on this bandwagon. Although the leaders of this prayer octave tried to enlist Father Paul in their support, he remained adamant that reunion had to come under the auspices of the pope. Coincidentally, about this time there was a controversy raging in Boston, Massachusetts regarding this very same question. This controversy involved none other than Father Leonard Feeney and his insistence on the thrice-defined dogma of “no salvation outside the Catholic Church.” In 1950, the Holy Father, Pope Pius XII, issued his encyclical letter Humani Generis, which, as we well know, warned against the distortion and watering down of Catholic truth in a vain attempt to present it in a more palatable form to those not of the Faith. Both Father Paul, although deceased ten years by this time, and Father Feeney were vindicated. Father Paul, always a man of great energy, with many ideas and plans for the future, was rarely ill. At 4:oo in the morning, February 8, 1940, God took him suddenly to Himself after only a few hours of pain from a heart attack. Although it was a terrible blow to his friars and sisters who loved him and depended upon him, in retrospect, they were grateful that he did not suffer a long period of incapacity. His funeral, on February 12, 1940, was attended by many important personages of the Church. Bishops from the United States and abroad were there. He was laid to rest in the cemetery of the Mount of the Atonement upon which he had planted the rough-hewn cross so many years ago. Wouldn’t Father Paul be pleased at the promulgation of Pope Benedict XVI’s Anglicanorum Coetibus, which has made possible the corporate reunion of so many Anglicans petitioning for entrance into the Catholic Church? One can imagine him smiling down upon them with the satisfaction that his crusade for corporate reunion is at long last being realized .